Classifying objects � thus collecting them into classes � is an operation both fundamental and common in everyday life as well as in scientific endeavours. Logic, philosophy, mathematics and computer science analyse this activity by means of such notions as �class�, �set�, and �type�. Furthermore, according to the so-called �logical (or na�ve) conception of classes�, these notions are related to the notion �concept� in that classes are considered �extensions� of concepts. This relationship, however, is a delicate one � as we have learned from the paradoxes of class theory. The contributions to this volume shed new light both on concepts and classes and their delicate relationship. 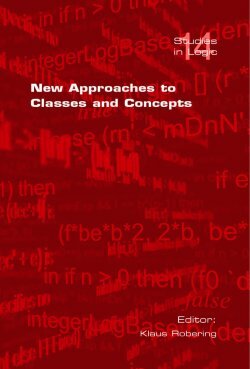 New and original approaches to these issues (e.g., map theory, -sets, intensional type theory, AFA set theory) are presented and discussed in the broader context of their application to problems from informatics and linguistics. The focus is on such matters as unrestrictive comprehension, extensionality, the relationship between the notions of concept, class and extension, and on unfounded (circular and infinitely descending) patterns of elementhood. These and related problems have always played a role in the development of set theory and have always delivered motivation for the development of unorthodox views and theories. This is also demonstrated in this volume by contributions dealing with the history of Zermelo�s axiomatization of set theory and Ackermann�s class theory with unrestrictive comprehension, respectively. The contributions of this volume are based on the presentation at a Workshop on �Alternative Set Theories � Alternatives to Set Theory� held at the University of Southern Denmark in 2006.